"Captain-C" = "Captaincy" - Get it? Nice play on words ITG! Perfect for a set like this composed of only players who have earned the coveted position of captain for their teams. With this set ITG has once again provided hockey collectors with fun and specifically themed cards to add to their collections. By only including captains in this set, collectors can rest assured that the players they find will be a solid group of individuals who have the prized 'C' on their sweaters. With recent ITG one-pack-box products like Enforcers and Canada vs. the World, the base cards have been more insert oriented. Captain-C brings back the standard base card in a shiny, spectacular form. ITG has given the base cards a foil background treatment - something really only seen on some of their higher-end products in the past. Scans of the base cards really don't do them justice. There is a streaking effect to the shimmer that must be seen to be appreciated when looking at these cards. I've been watching many breaks of Captain-C, and over and over I have heard collectors praising the way the base cards look. While I enjoy the foil on the base cards, I am less a fan of the rest of the base card graphics. I feel that some ITG products have moved forward in terms of having modern designs. The design ITG uses on these base cards though is a bit too plain for my liking. The solid starkness of the colors is what makes this design dated. And while it's great that Captain-C features pretty large photographs on the cards, a few of the older looking photographs clash a bit with the foil background. So while I am a huge fan of the glimmering foil, the rest of the base design leaves me wanting. Each pack of Captain-C comes with 3 base cards. Though not stated on card, these cards are limited to only 150 of each according to the ITG website. Gold versions of the base cards can be found one per pack. These are limited to only 50 copies of each. Each box/pack of Captain-C comes with a mix of five game-used cards and autographed cards. Some of the autographs and memorabilia cards are more short printed than others. Consult the ITG website for more information on which cards are short printed. As usual, most cards do not show a print run and are not individual serial numbered. It is important to visit ITG's site and find out the rarity of the cards you pull. 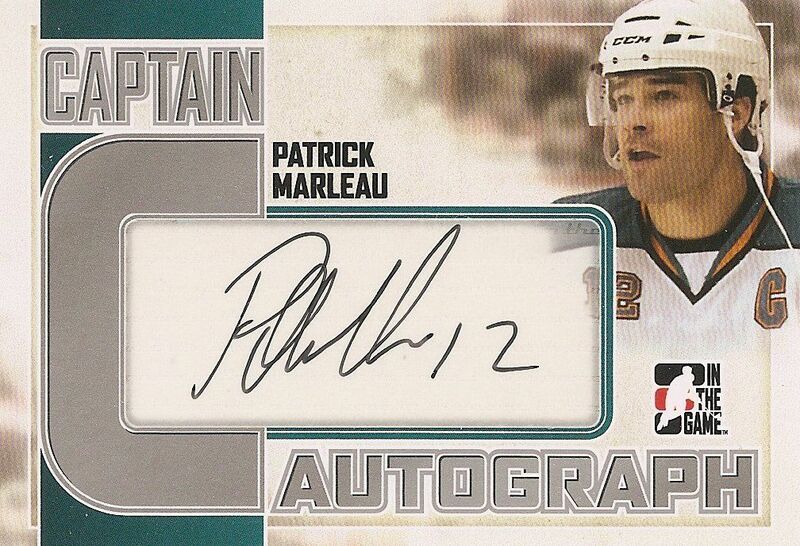 The standard autographed card in Captain-C is just like the Patrick Marleau shown above. You can certainly tell it is an ITG autograph card design. Though it has the Captain-C brand name featured on the left side of the card, it shares similar characteristics of all ITG autographed cards that run throughout their product lines. As usual, the autographs are on stickers but blend in very well with the card so it is difficult to tell it is a sticker-autograph rather than an on-card auto. These cards also do a nice job of featuring the team colors of the player so they look great alongside licensed NHL cards. I also like the photos that ITG used on these cards. They have been very good about hiding the fact that they don't have an NHL license. As you can see with Marleau, you can definitely tell he is with the Sharks even though there is not a Sharks logo to be found. Slick job ITG! 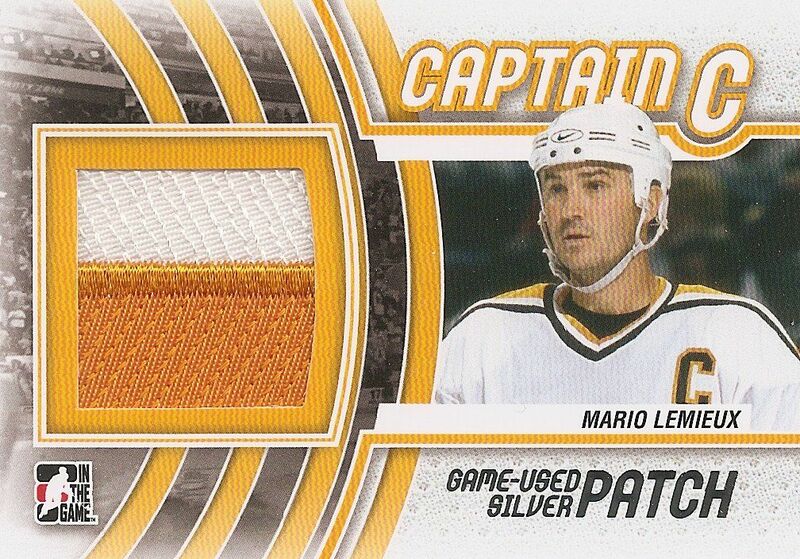 The standard jersey and patch cards in Captain-C are like this Lemieux card shown above. I am a big fan of these cards. They are very bright and show a sense of modern card design. The graphics on the card are vibrant and do a great job of showcasing the team color. I also love the fact that the level of the card (silver or gold) is in foil. I always feel that a tasteful touch of foil on a card does a lot - and it certainly looks great here. And just like the autograph cards, the photos here also mask the fact that ITG doesn't have an NHL license. A quick glance at the Lemieux definitely gives off the impression of the Penguins. On the back of the card, it clearly states that the material on the front of the card came from a game-used jersey that Mario Lemieux wore during a Pittsburgh Penguins game - impressive. 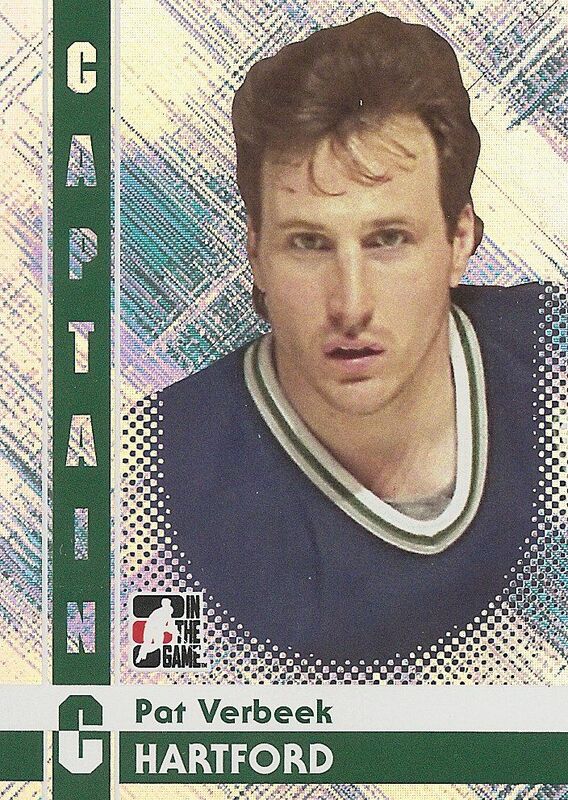 Not all of the players featured in Captain-C are NHL captains. ITG takes the opportunity to get some younger players into the mix as well. 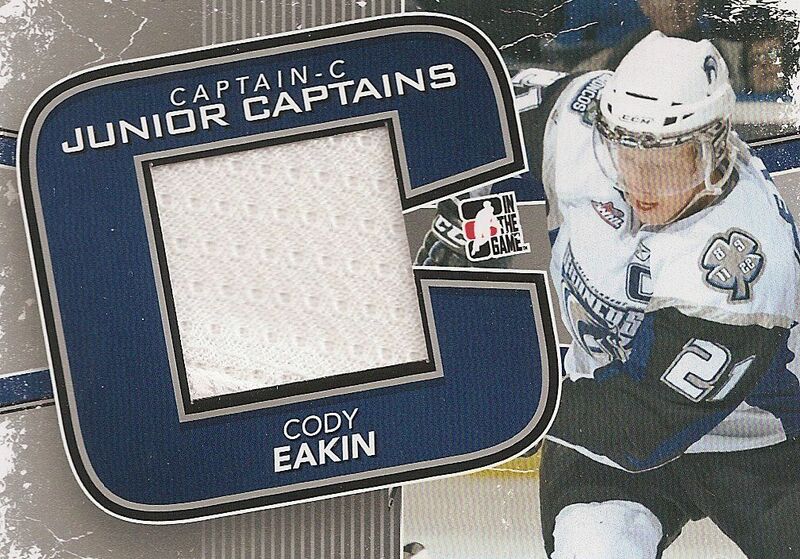 Here we have a card of Cody Eakin when he was captain of the Swift Current Broncos. It was a great idea to add in captains of junior teams to the product so the player pool could be more diverse. Some other great inserts can be found in Captain-C as well. ITG has included cards with game-used sticks as well as the actual captain's 'C' from a game-used jersey. Because the 'C' is so large, they have been broken up into 2 cards. Collectors can have fun chasing both parts to put together an amazing piece of memorabilia. Captain-C from ITG is definitely a winner - just like the players it features. ITG has stated that it has only produced a very limited number of this product... and I believe them! Many of the places I go to purchase cards have sold through their initial stock of it, and ITG has stated that it has sold out of it on their end. The base cards look very nice and the game-used memorabilia cards are spectacular as always. If you're looking to try ITG for the first time I would say this is the product to do so. It's definitely one of my favorite ITG products that has come out recently. Get it while you can! This stuff might dry up quickly! I think that this year ITG has gone overboard! They have created a great product, and it has its value......unlike some of there other products this year. Enforcers was the most unappealing product from ITG this year, but with this release I have to say this is a GREAT product. I really love the refractor design of the base cards, as they really bring out a new FX. The Jerseys and Autos have the same neutral design as all the other ITG products....not saying its bad. The design of the product is great and I would have to give it an 8/10 just on the design itself! In each box on average you are supposed to receive four hits. At least 1-2 Autographs, 2 Jerseys and 1 patch card. You may say that this could be a good product to compare to Panini Limited, but but from the amount of value that you get back in return from this product, Limited can not be in comparison. This is a great product, and even though ITG released as a short run, it is bound to be sold out, so everyone has to get their boxes soon! i love this product. you get such nice cards in it. there are very nice chase cards like the half the c from players jerseys and it is a very limited product only 4000 of them prodused. Thanks for sharing! My box is arriving this week and I will let you know if any Sharks arrive. Great pulls. It's always nice with so few cards in a product like this to pull so many cards of your team. The nice thing with a set like this is that there are so very few "average" players that have achieved the rank of captain. You're almost guaranteed someone good. If that Lemieux is up for trade, let me know. I've got some pretty good Sharks cards I could offer up for it. Some of the sites and stores are selling out + 1 guy on SCF bought 8 cases = 160 Boxes. Get em while you can! Just ordered a box of this from Canada Card World (they have 6 boxes left btw). I liked 11/12 Heroes & Prospects so this seems like a no brainer. Hopefully I snag something Linden. As an aside, thanks for this blog particularly the videos. I got back into sports cards this year, mainly hockey. I live in Australia, where sports cards seem to have really died off, so this has been helpful in buying the right products. After all, shipping across the Pacific ain't cheap! thanks! wow, yea, it really does sound as if this product will be hard to find pretty soon. As a follow up I got my box yesterday. Pulled two Silver GU Jersey cards, one Oilers and one Canucks, both Mark Messier! I guess this is better than breaking a box of Captain Crunch! Very solid product IMO this is probably the best of the boxes that come with just one pack, I didn't really like CvTW or Decades but this product is just amazing, every box is got something sick inside! The base are such a nice design as well kudos to ITG on a great product! thought its been a great product with them using sticks, skates, i think i saw pad peices, also great names. its selling rlly quick and for a good reason. Love the design and am very impressed with ITG this year! I really like this product this year. The base cards are probably one of the base made by ITG. The hits are really nice as well since most of the cards are limited, and they didn't make much of this product at all. I may purchase this product (if I do, it would be my first one pack product). Hopefully, there is still some available at my lcs. If not then I might just settle for BTP. This may be the best ITG product so far. Base cards look great, and the hits look pretty good too. I like how ITG included the junior players in the set too. But my big hangup on ITG is the lack of NHL liscence, if they had that, I can only imagine what they could do. Hopefully we see this set next year too! Great review. I like the set. I am a player collector and none of my guys have worn the "C" and yet I am getting into a case break just because of how nice it looks. The auto list is solid and some of the GU look just amazing. the great part of this set is that the majority of the cards, even base are big name players or legends from the past which makes this a fun set the collect. personally, i think its great and will definitely be purchasing some of this product after all of the good comments and review of captain-c! What a great product. I really do love it. While I'm not a big fan of the base design, just the bang-for-your-buck seems to be awesome in this product. I haven't seen one awful box. I'm not really sure how much these cost, but if it's under 100, than you seem to do well on every single box. 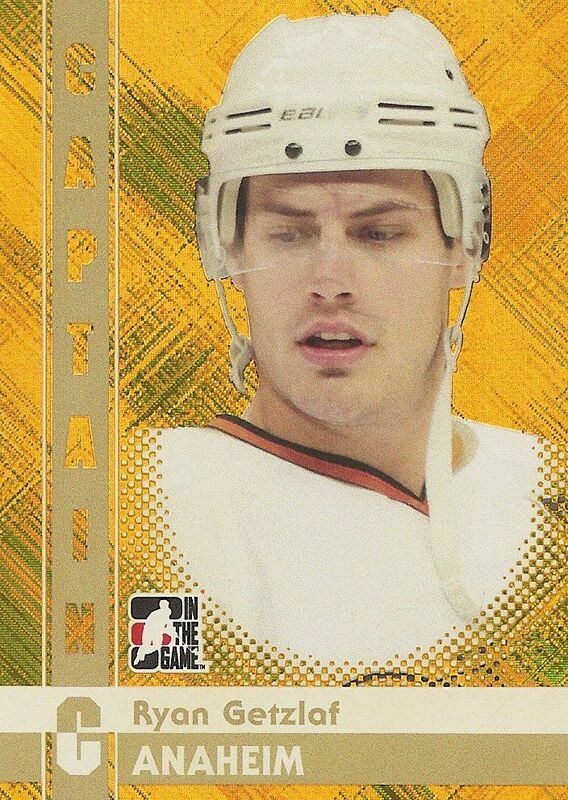 I really do like Captain-C. One thing I like is the base card design. Another thing I like is that the hits are guaranteed to be a at least somewhat good player since there are/ were a captain. It looks like a very cool product, I am really considering purchasing a box, and I love the look and design of the cards! Love the review! This years Captain C is very cool. The foil base looks pretty awesome and the gold cards have a special look to them. I still like ITG Heroes and Prospects better but, both are still AWESOME. I always seem to have a thing for the auto and jersey/patch cards from ITG. Nice results of your to boxes especially the Lemieux. Thanks for the contest and box breaks. WOW! This product is amazing! ITG really pleased me this year with Canada vs. The World, but I must say this is the top of the top. I really love the chance of getting really great players memorabilias. This is a top class product. I just wish I won't get Luongo, because it is one of the only players that I don't like at all. The vintage memorabilias are really wonderful and I wish to get some of them. One other problem is to see Thornton with the Bruins and not with the Sharks. Great Review! Very thorough and detailed! Looks like some nice cards, especiall the skate blade card you got in the video! Evilcise1234- This product really seems to be a great choice or gasp for your money back. Ether really good or just plain disappointing. I'm not a huge fan of ITG but I really like the vintage stuff!Nice review though! Captain C is pretty cool. I like the design of the base cards and the cards overall. I just find it boring since there are not enough subsets. I don't believe I am going to buy any boxes of Captain C. It's cool, but I don't like it that much. Great idea and as always, ITG does an amazing job in making these cards. Real cool the base are very shiny and look really nice in person. Definitely a creative product although the price in my opinion is a little to high (for me at least) in terms of what a average box is. Otherwise very cool, I'm a sucker for vintage memoribillia! I love the fact that there are limited base cards and cuts! also my PC team rangers is well represented. Also you don't see much Pavel Bure on Florida so that is very cool! pretty cool item and its awesome. Great set, one of the few ITG sets I've liked! The stick and jerseys as well as the Complete Jerseys appeal to me so much! Great break and review as usual. My only beef with this product is that they seem to have no Ryan Callahan cards aside from the one you pulled of his junior sweater! I think captain C product is a really nice product. The cards are all sharp looking and very appealing. You get good value for what ur paying. Thanks. sick pull! Have a alex stalock young gun exclusive out of 100 and in mint condition, interested in a trade? plz reply. I am not a huge ITG product fan but I though that it was interesting that they actually used foil on the cards. I don't really buy ITG but those cards look awesome. For the price, I think that you get your money back in almost all the boxes. One of the best ITG product this year. This years captain C cards are very cool. I have no hockey cards so I entered this contest. My cousin just recently introduced me to hockey cards and they are cool. Best ITG product this year. I like these cards a lot and have a album of cards,thanks for sharing.